Sold and served at almost every cafe, diner, restaurant and baker’s shop across the United States of America. Not only is it one of the most widely served cake over there but perhaps one of the most popular cakes used in creating confections such as the cake pops, cake bites as well as one of the most staple cakes used by cake designers and decorators. It seems this cake is the go to one on offer for anyone with a chocolate craving! This is not entirely strange as this chocolate concentration of a cake is absolutely delicious with a cup of coffee, which is eligibly the national drink of the USA (whether a straight American coffee, black with no sugar or a cafe latte)! 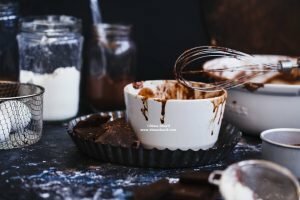 So what exactly is a Mud Cake? It is a dense, moist, almost fudgy cake that seems to be a concentration of chocolate. It is very similar in concept to the flourless chocolate cake and is technically somewhat between the Brownie and the Fudge, and believed to be a descendant of both. Also believed to have originated in the USA and moved from there. It is therefore a relatively new addition to the global repertoire of the pastry section of cuisine. With that said, do note that the Mississippi Mud Cake is different from the Mississippi Mud Pie, which is a very sweet custard type chocolate pie that is baked in a chocolate cookie crumb crust. On the same note cuisine experts seem to agree that there is not enough evidence to support the mud cake originating from Mississippi or any other state along the river’s bank! Many seem to agree that the word Mississippi must have been added to the name to make it more appealing. However, evidence does support its originating from the North American cuisine, as the chemical leavening, its overall richness, its denseness and thickness are very uniform with American baking and cake making characteristics and style. Moreover, the original mud cakes that have been labelled as Mississippi Mud Cakes usually included a marshmallow topping. The earliest recipes all include Marshmallows in the making. 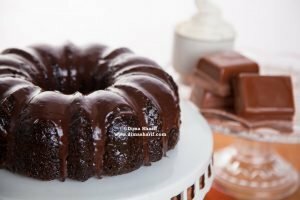 There is another variety of popular American Mudcakes known as the Boston Mudcake, which has a very moist interior that is almost fudgy and the cake is always covered with Ganache (see the recipe on this link). It is worth mentioning here that the European versions of the mud cake are usually topped with Meringue, which seems to follow the marshmallow inclusion (in variation). In Finland and Sweden, on the other hand, they have what is known as Kladdkaka that is a dense, sticky chocolate cake very similar to brownie (essentially a mud cake). The Kladdkaka is topped with whipped cream. making a mud cake always follow the muffin method. It involves separately mixing dry and wet ingredients, the wet being heated and thoroughly melted and combined before being added to the mixed dry ingredients, after which all is gently mixed together. Almost all recipes call for the use of melted chocolate alongside cocoa powder, which leads to such concentration of chocolate. The cake is very much like a brownie, however, also includes the crumbness of cake, therefore, it cannot be completely classified as a brownie. The Mud cake has a tight crumb, which is what lends it its dense texture and makes it more steady and less likely to crumb as you slice it. This characteristic is what makes it a mud cake and not purely a cake. The Mud Cake is a very good base for cake decoration as it is one of the easiest and most reliable cakes for carving. It is also firm enough to hold its shape, therefore, easier to manage especially if you are a beginner in decorations. Most my “All About Cakes & Cupcakes” course trainees find it easier to layer, level and fill the almost crumbless mud cakes in comparison to the crumbly and more easily squashed sponges. Both, however, are good bases for decoration. Perhaps to the decorators, the most appreciated characteristic of the mud cake is the fact that it lasts for weeks, fresh and without spoiling! This is essential because most decorators need time working on the decorations and assembling the cake, especially those intricate, carved and layered designs. Better yet, the mud cake is known to taste the best 3 days after baking! That does not mean it won’t taste good on the day, but it does develop all its rich chocolate flavours and its signature texture after 3 days of baking. 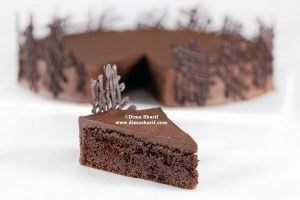 In fact, many serious bakers in the US will tell you it is a shame to slice a mud cake before the 3 days had passed because you will have deprived it from developing its beautiful texture and rich flavour. Finally, the mud cake is a very good cake for freezing. It will not acquire that “frozen” taste nor will it lose any of its attributes. This is also helpful as you would make it in advance and freeze it to use when needed. Decorating your own Moana Cake!